Look for the Proudly Wisconsin Badge when shopping for cheese. Any brand of Wisconsin Gouda or Swiss can be used in this recipe. Heat oven to 375°. Unroll crescent roll dough and separate into four rectangles; place on an ungreased baking sheet. Press to seal perforations. Cut each rectangle in half widthwise. Bake for 8-12 minutes or until golden brown. Remove to a wire rack to cool completely. Meanwhile, cook and stir bacon, apples and onion in a large skillet over medium heat until bacon is crisp. Remove bacon mixture to a paper towel to drain. Cut each cheese slice in half. 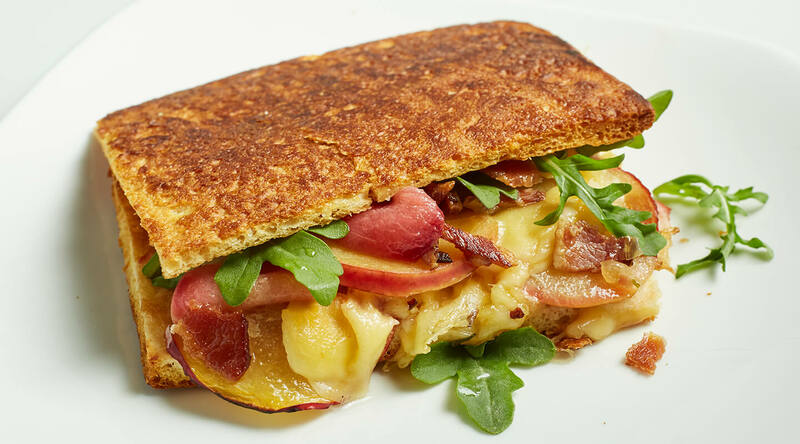 Layer four crescent rectangles with 1 slice swiss, 1 slice gouda, plum slices, bacon mixture and arugula. Top each with remaining swiss, gouda and crescent rectangles. Cook in a panini maker or indoor grill until cheese is melted, about 2-3 minutes. Edelweiss Emmentaler Swiss cheese was named, “The Best of the Best” in Cooks Illustrated! Big wheel swiss cheese was made by hundreds of Swiss families that immigrated to Wisconsin at the turn of the century. It was styled after traditional Emmentaler cheese from Switzerland. There is only one cheesemaker making this cheese today in Wisconsin.